In this super-sized episode, Patrick, Mike and Adam Thas discuss The Wolverine and the future of comic book movies while Mike and Adam share more stories from the trenches of the 2013 San Diego Comic-Con. Snikt. I haven't seen The Wolverine yet, so I can't weigh in on that, really, but wanted to comment on some of the Comic-Con discussion. I'm really glad to hear that Edgar Wright is an awesome dude in person. Kind of the opposite of what Patrick said about Marc Webb, it makes me feel good about loving his movies and increases that love exponentially knowing he's so nice and friendly. I'm also glad to hear a positive reaction to what the guys saw of Gravity. Maybe it's just that I like the prospect of Sandra Bullock and George Clooney being in a movie together, but I have a sneaking suspicion that movie is going to be really great. I dont think I had the same strong dislike to the third act as you guys (and most critics) seem to have had, although I do agree that Viper was a useless villain and the silver Samurai was a bit over the top. Despite not having a huge problem with it I did feel that something didnt click in what seemed to be an fairly sound movie. Cant put my finger on it just yet. I really liked the mild intelligence (?) that seemed to be throughout the script, with interesting character motivations, not everything being straight forward, as well as the thematic through line of Wolverine's pain and him unable to be put out of his misery (he's like a bear...rrawwrr). It was nothing major or overly impressive really but it was nice to see in a major production like this that usually has so many writers/cowriters/production notes that end up removing any notion of thematic consistency. Also, on the note of translating stories rather than characters, A lot of DC stories have been translated (League of Extraordinary Gentlemen, V for Vendetta, Watchmen, etc) which have had a fairly low level of success. Im not a huge fan of Watchmen (I admit I havent been able to divorce it from the book, but I also dont take complete responsibility for that). On paper the adaptation of well loved stories makes a lot of sense, but in practice it just doesnt work. Comics are deceptive. They look like storyboards, but they are far removed from live action cinematic storytelling. When comics are done well they not only tell a good story, but they use the comic form to assist in the narrative (not only in the near pretentious Alan Moore sense, but more so in the more scientific/artistic Scott McCloud sense). Oh, and p.s. Green Arrow is objectively Awesome. Stop those groans now please. I don't actually have a problem with Green Arrow. I would have made that noise for any character he named, because it was funnier to make it seem like his troubles were not worth it. Because I am a terrible friend and person. Ah, yes, I see. Your humour was not lost on 99% of the audience. Unfortunately, I appear to be the 1%, and that is why the occupy movement hates me. Man, the To-Do List. It's pretty much the definition of uneven and not especially good. I did like Scott Porter's version of a surfer bum though. I think I liked The Way Way Back more than you Patrick but I have to admit its got a lot of problems. For one thing the damn ending its straight out of movietown (a place where reality is nowhere to be found) and feels less genuine, I think my mancrush on Sam Rockwell made me give that movie a higher rating than I normally would. But you know that you have to do an "F This Movie" about The X Files films, now. Don't know how anyone else feels but I need to hear the thinking behind some of the things you said here. For starters, glad to hear Mike and Adam had a good time at SDCC - as super-fun as the videos were to watch it didn't always seem super-fun to be there! Nice Evangeline Lilly anecdote - Canadians really are great, eh? As for the movie, I don't have a ton to say about it but I liked it quite a bit - I think my high points and quibbles were all touched on by you guys. 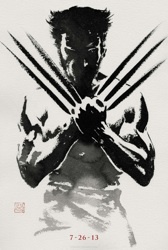 I watched it right after Elysium and contrary to my expectations, I enjoyed The Wolverine more. Like you, Patrick, it seems like my enjoyment of movies lately has been inversely related to my expectations, but I don't think it's because I get my hopes up SO high or anything; i.e. I'm not going to let these movies off the hook and blame my expectations. Anyway, I was pretty much planning to skip The Wolverine but I'm glad I didn't - it was a solid movie for sure. Great podcast guys - I love hearing the three of you talk comic book movies!